CUB created this help center to keep you informed of the consumer group’s information campaigns and other breaking news that matters to your bottom line. 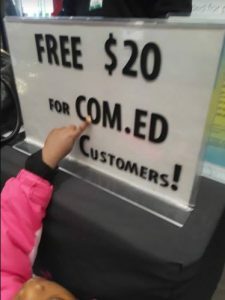 Alternative supplier marketing at a movie theater. Be on high alert if someone approaches you with a utility “discount” that’s too good to be true: CUB is constantly getting complaints about alternative electric and gas suppliers using predatory sales tactics. In addition to knocking on your door or calling you on the phone, suppliers also market Illinoisans at grocery stores, airports, even the movie theater (see photo). Sign a petition for stronger consumer protections in the electric and gas markets. Know the utilities’ “prices to compare”—the rates customers should compare with alternative supplier offers. Ameren: 5.026 per kWh for the first 800 kWh of usage, 4.367 cents per kWh for usage after that. Note: These prices are good through May 2019. Note: These prices are for February. They change monthly. 1) Be careful about people at your door who say they’re from the “electric company” or “gas company” and offer to lower your bill. Don’t give out your account number or your bill unless you’re sure you want to sign up for an offer. A dishonest sales rep can use your account number to sign you up for an alternative supplier without permission. 3) Ask if the rate is an introductory or promotional rate, how long it lasts, and what the new rate will be once it ends. People complain to CUB that the low price they signed up for disappeared after a few months and their bill skyrocketed. 4) Ask if the plan charges a monthly fee, which will inflate the per-kWh rate. We’ve seen monthly fees as high as $9.99. 5) Ask if the company charges an exit fee if you want to leave a plan before the contract is up. Exit fees are capped at $50, and you can avoid getting slapped with one if you cancel a contract within 10 days of the supplier’s charges first appearing on the bill.